How It’s New York: Sebastian McLaughlin is an emerging artist from Ireland who has been living in NYC for the past two years. And NYC is one of the art capitals of the world. How It’s Irish: Of course, Sebastian is Irish himself. He’s also one of our bloggers, and helped us design this website. His work draws influence from people in his life, places, human struggle, history and politics. 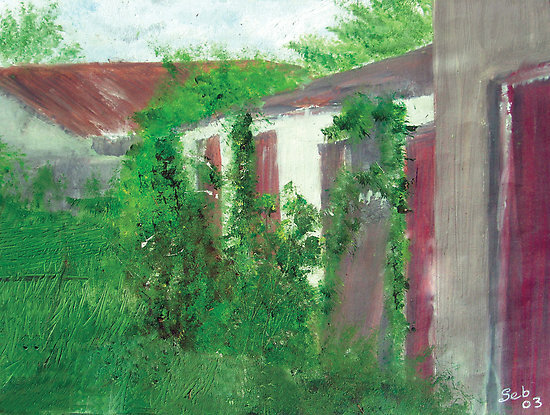 He mainly uses acrylic paint on canvas but also ventures into oil pastel and paint. Reluctant to call myself an artist due to the responsibility and the critical childhood I endured but nevertheless feel I have something to share to the world. New York, on March 5th 7pm – 9pm. 580 Eighth Avenue at 38th street. There will be free wine! Born with the intention of giving the opportunity to young artists of exhibiting their work in a high-quality art space in the heart of Manhattan. HarvestedFreshArt is a multidisciplinary exhibition created to allow a quick look at the diversity of the younger and fresher art scene in NYC. The Opening Reception will take place on Saturday, March 31 from 7- 10 PM. And check out Sebastian’s work on his website.